The look of the house has changed dramatically since our last post. 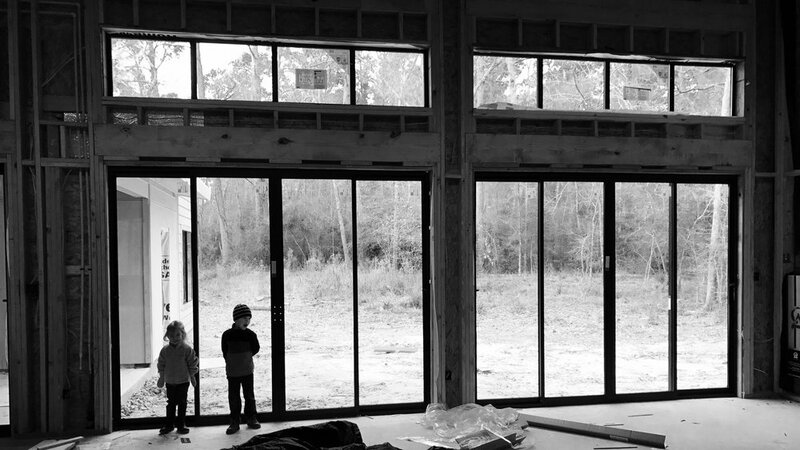 All of the aluminum Milgard windows, aluminum Milgard sliding doors and temporary exterior doors are now fully installed. The painters have caulked and done their first pass and will be returning this week to do any touch-ups. We give our exterior paint specifics in our Exterior Paint Colors for the Modern Home post. The roofing crew also made fast business of getting the shingles on our simple low slope roof. Lastly, floor protection went down inside to protect the slab which will be polished later. Spray foam insulation (and batt in a few key places for sound) is going in quickly this week. The HVAC will also be installed this week with some special finishing details that we can't wait to share! We've been busy finalizing cabinet drawings, quartz countertop, tile and decorative lighting selections as well as getting interior door quotes and ordering the last of the plumbing items.